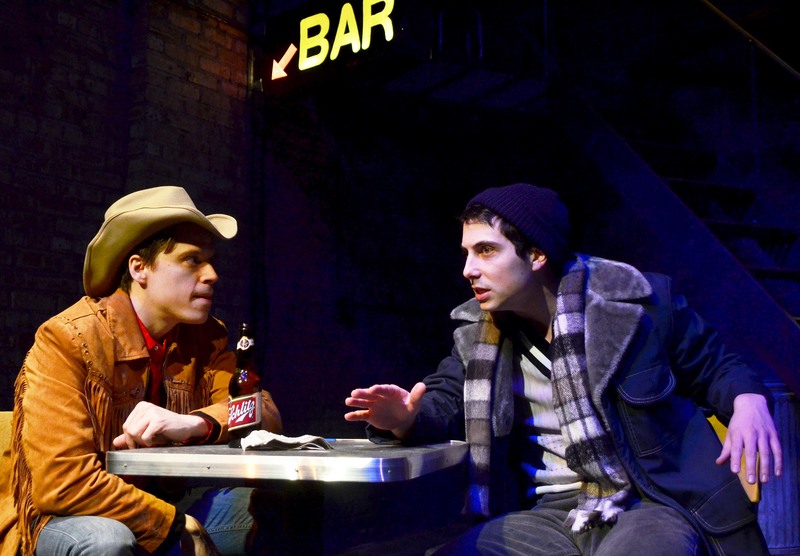 Lifetime Theatre presents the World Premiere Adaptation of MIDNIGHT COWBOY. The play follows Zach Livingston’s (Joe) recent arrival to New York City. A hopeful Livingston is ready to make his fortune as a prostitute. He is instantly endearing as this gullible, wannabe con man. Through Hainsworth’s effective flashback scenes, we learn his backstory. We understand why he carries a radio, wears a hat and sells his body. Livingston’s desire to be liked is heartbreaking. He continually believes in people and gets scammed and beaten. The end of Act 1 is particularly brutal at the cold-blooded hands of the malicious Jack Miggins (Perry). From first appearance, Miggins’ controlled facade makes my skin crawl. Director Christopher M. Walsh (no relation) keeps the transitions seamless. Livingston never leaves the stage or really changes clothes. Still, we always know where he is in present day NYC, recent past Houston or childhood in Albuquerque. Walsh has doors slide, beds move and characters change. The talented ensemble play an array of colorful folk. As Woodsy, Patrick Blashill perches quietly in the rafters strumming a guitar. Later as Towny, Blashill drops the rugged mystique of a cowboy to embody a flamboyant mama’s boy. Livingston moves from person to person looking for a connection. When he arrives on Sally’s salon step (played by Ann Marie Lewis), I held my breath hoping Livingston will bask in attention from a loving grandma. Lewis’ questionable child-rearing statements bring awkward chuckles and more concern for Livingston. Yet, Hainsworth stayed true to his commitment. Livingston isn’t the only victim! Walsh lets us see glimpses of humanity behind the cruelty. A tremble. A look. A confession. Adam Marcantoni (Ratso) portrays this best. Initially, he’s this fast-talking slime-ball. In the second act, we hear his sad tale. Marcantoni transforms from sewer rat to Remy from Ratatouille. We are rooting for him and Livingston to get to Florida. Lifeline is a theatre company dedicated to adapting page to stage in excellence. I’m always entertained by the heart and humor that inevitable seeps in to every production. Hainsworth and Walsh, in particular, are often a hilarious comic pairing onstage. MIDNIGHT COWBOY is maybe the darkest play I’ve experienced at Lifeline. The loneliness, the cruelty, the sadness stings. The bittersweet ending definitely leaves a mark. After seeing it last night, I still feel bruised today. Saturdays at 4 and 8 p.m.